The shared gestures suggest the primates — as well as humans — may have inherited the traits from a common ancestor. Gestures are a form of visual communication that humans often use with seemingly little thought. For example, if a person wants someone to go away, the individual might fling their hand to shoo them off. Similarly, if a person desires something, he or she might hold out a hand flat, with the palm up. These gestures connect us to other primates, since the moves are exactly the same in bonobos and chimpanzees. "We don't have to learn them; they are part of the shared ape inheritance," Richard Byrne, an emeritus professor in the school of psychology and neuroscience at the University of St. Andrews in Scotland, told Seeker. Evidence for the shared forms of visual communication is presented in a new study by Byrne and his team. 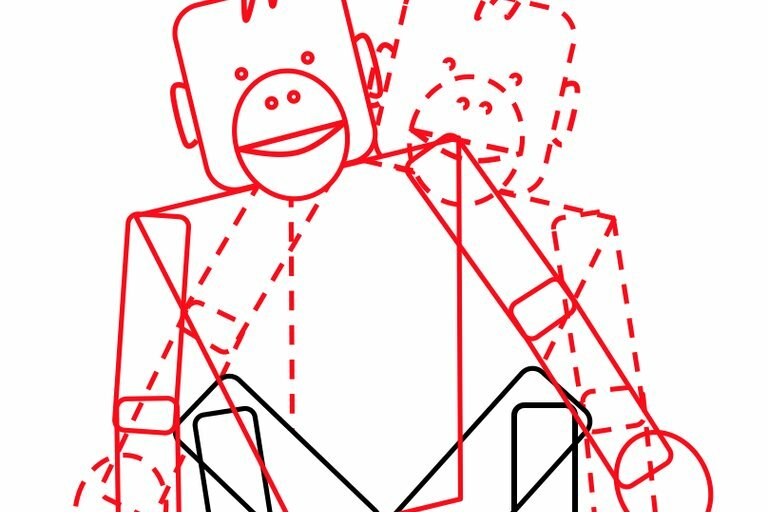 The research, reported in the journal PLOS Biology, focused on bonobo and chimpanzee gestures, and found that approximately 90 percent of them overlap. This suggests that the cognitive ability underlying such visual communication skills was inherited from their common ancestor. Lead author Kirsty Graham of the University of York’s department of psychology told Seeker that bonobos and chimps are closely related. They are thought to have diverged around one million years ago along the Congo River. For decades it was believed that chimpanzees were the closest living relatives of humans. Recent genetic studies, however, show that bonobos also have about 99 percent of our DNA, which means they are now thought to be as closely related to us as chimps. For the new study, Graham collected data on two neighboring communities of wild bonobos in the Luo Scientific Reserve in the Democratic Republic of the Congo. 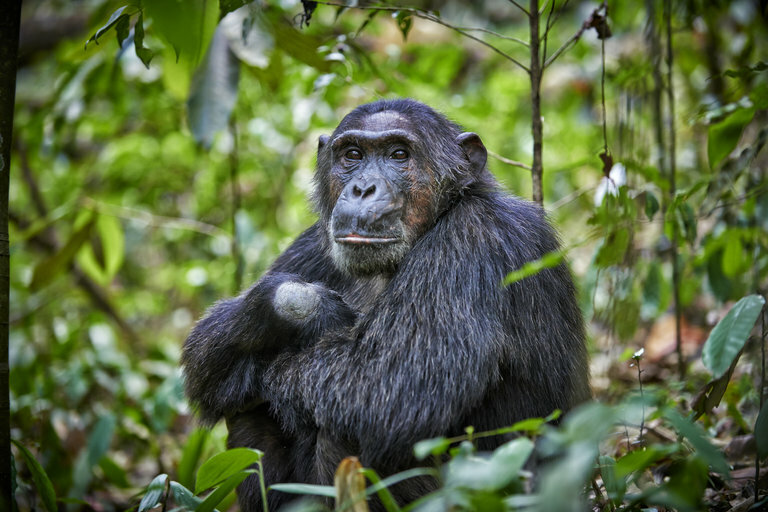 Co-author Catherine Hobaiter of the University of St. Andrews traveled to another part of Africa, the Budongo Conservation Field Station in Uganda, to gather data on a community of wild chimpanzees. Both researchers filmed interactions that took place between the primates. The scientists next analyzed the 2,321 instances of intentional gestures that they recorded. Such gestures included movements of the body, limbs, and head that are directed to a recipient and do not achieve a goal through force. Most, but not all, of the gestures mirror the physical form of the corresponding behaviors. "Humans can often guess the meanings correctly, but that is likely to be because we too have inherited the potential to use and understand many or most of the gestures found in chimpanzees, bonobos and gorillas, from the shared common ancestor," Byrne said. 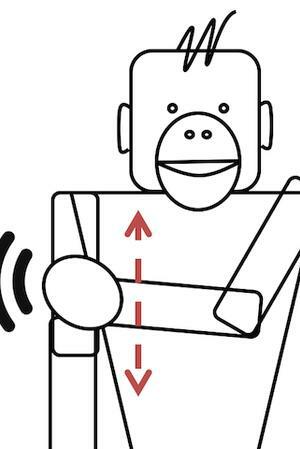 Videos showing these and other non-human primate gestures are at The Great Ape Dictionary. Graham added that she does not think the gestures are iconic. "To be really iconic, a bonobo would have to know that their gesture looked like the thing that they're communicating about and know that the other bonobo would understand them because it looks like that thing," she said. "That would be a lot to unpack, and we don't have any evidence suggesting that that's how their gestures work. ... If the gestures resemble the actions, it's maybe for different reasons." Humans often create symbols that bear little resemblance to their corresponding behaviors or meanings. Examples include giving a thumbs up for approval and lifting the middle and index fingers to form the v-shaped "peace sign." "Sign languages and symbolic gestures like 'thumbs up' or the 'peace sign' are quite different because they are acquired culturally by social learning, not from genetic hard-wiring, and are therefore culturally specific," Byrne said. "In some cultures," he noted, "the peace sign is not understood, and thumbs up is an insult." Bonobos, chimps, and humans all raise their arms as a gesture, but in humans this usually is a non-vocal way to draw attention to oneself. Students in class might raise their hand, for example, signaling a desire to be called upon. Byrne said that this gesture was taught to him and to others. "It did not come naturally," he explained. Some human gestures were therefore inherited from our primate ancestors, but others were not, the research suggests. Graham said that while she and her colleagues are always careful to keep their distance from the wild primates they are studying, sometimes their inquisitive subjects break that intended barrier. She recalls a young bonobo named Natsuko who would teasingly run up to the researchers, shake branches, and then run away. Bonobos appear to do this amongst themselves to get attention. "'Object shake' is a somewhat ambiguous gesture, so I don't know what she wanted from us, but it definitely wasn't for us to ignore her," Graham said. Robert Seyfarth is one of the world's leading experts on primate communication and other primate social behaviors. He and his wife Dorothy Cheney have conducted decades of fieldwork on various non-human primates. The pair were mentored by Robert Hinde (1923–2016), the noted animal behaviorist who supervised Jane Goodall's dissertation on the behavior of chimpanzees in the mid-1960s. Seyfarth told Seeker that he was not surprised by the discovery that bonobos and chimps share many gestures, and that physically similar gestures in the two species have roughly the same meaning. "Chimps and bonobos, after all, share many things: They live in similar habitats and have similar anatomy, social organizations, and social relationships," Seyfarth explained. He said that the similarities could have evolved in a few different ways. The gestures might have evolved before the shared lineage of chimps and bonobos separated, or they could have converged after separation, or a bit of both. "Given the results of this paper, it would be interesting to compare the gestures of gorillas with those of chimps and bonobos," he said, explaining that gorillas are not as closely related to chimps and bonobos as the latter two primates are to each other. Byrne indicated that this additional research was on the horizon. He said, "We have yet to compare the meanings of gestures of the chimpanzee and bonobo with those of the gorilla, but that species too has a repertoire of gestures that are very similar in physical form, and I would predict that they too will prove to be closely similar in meaning." Gorilla DNA suggests that human primate forbearers and gorillas last shared a common ancestor around 10 million years ago. If gorillas do share certain gestures with humans, bonobos, and chimps, then those gestures could have been present in the human primate lineage for millions of years. The researchers hint that the likely inherited longstanding skill helps to explain why people may understand non-human primate gestures so well. "We have just finished an online experiment with over 15,000 participants assessing whether humans can understand chimpanzee and bonobo gestures," Graham said. "We showed people videos of chimpanzee and bonobo gestures and asked what they think the gestures mean. We're analyzing the results now and it looks really exciting, but that's about all we can say for the moment."